Reflecting the past 20 years of intense research in radioimmunotherapy, this timely reference surveys an expansive breadth of topics on the evolving developments in radiation therapy. Placed in the context of advances in cancer treatment, chapters progress systematically from basic principles and properties of radionuclides to detailed summaries of current cancer therapies. Up to date, clearly organized, and thorough-sure to become a standard in the field! 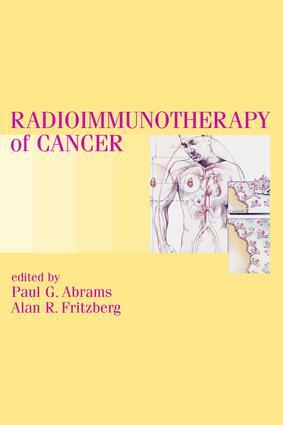 With contributions from nearly 50 international experts and containing over 1300 literature references, drawings, photographs, tables, and equations, Radioimmunotherapy of Cancer is an invaluable and indispensable reference for physicians in nuclear medicine and medical physicists; oncologists, radiologists, radiochemists, and radiopharmacists; immunologists, pulmonologists, and cancer researchers; pharmacologists and drug delivery pharmaceutical chemists; and upper-level undergraduate, graduate, and medical school students in these disciplines. The past two decades have provided an opportunity for investigators to explore the capacity of monoclonal antibodies and other targeting molecules to deliver therapeutic doses of radiation via radioisotope conjugates. This book assembles a strong cast of these investigators to review the progress that has been made and to clarify the challenges that remain. …a clear, complete and outstanding report of the current status of radioimunotherapy…. …highly recommended to nuclear medicine residents, but it also serves a solid review of radioimmunotherapy for physicians who have been in this field for many years. "…collects different contributions from the most important investigators in the field….